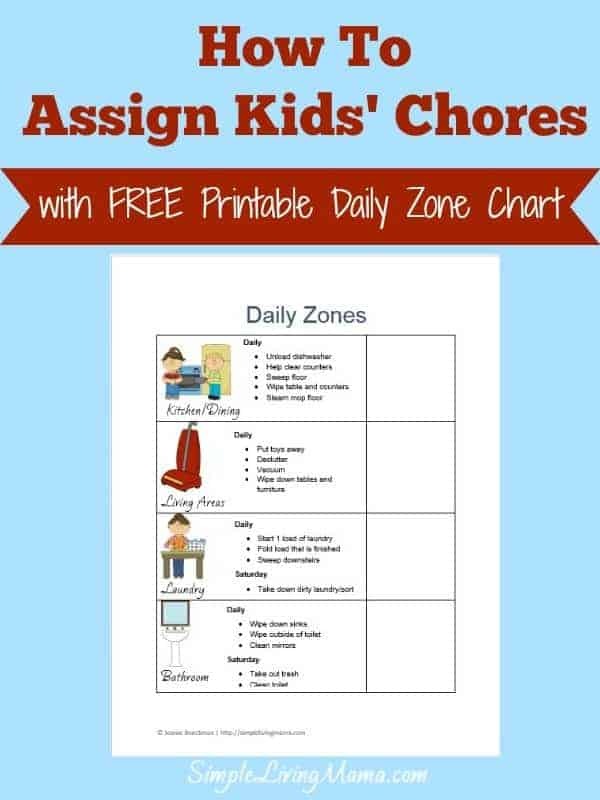 I have struggled in the area of chores with my kids. It’s one of those things I know they need to do to learn responsibility, but if I just randomly tell them to do something it doesn’t work out very well. I finally figured out how to assign kids’ chores in a way that is actually fun and helps us stay on track. I created a Daily Zone printable. First, I divided my home into four main zones. Bedrooms are the responsibility of the bedroom owner, and I keep up with my own bathroom. Each of my children has a color-coded square. I colored the squares myself. You could add an initial or color them yourself, too. I also used Velcro dots to attach the squares and move them around. Every day of the week they look at where their square is placed and they can easily see what their chores are for the day. Saturdays include a few extra chores. Since my children are all still so young, I work alongside them in most of the chores, and because I only have two children old enough for chores, my husband and I take on the other two zones entirely on our own. My hope is that by working alongside them and giving them responsibilities now, they will quickly learn how to do the chores correctly and will understand what is expected of them as members of the family. We all have to work together to keep our home running smoothly! These chores are separate from their morning chores, which include tidying their rooms and personal hygiene. Also, if anyone makes a huge mess either with food or toys, it is their responsibility to clean up (usually with parent help). My husband and I are beginning to discuss allowances for our children. Our oldest two are only six and four. I am thinking if they complete their zones each week they can receive a set allowance, and they can earn more for going above and beyond. How do you assign kids’ chores and handle allowance? I have my daily zone printable available for FREE to my weekly newsletter subscribers! Been toying with the idea of a job jar~! always hard to get them to help out. It can be a challenge, Lana! Hi Joanie! Thank you for linking up with us at the Laugh & Learn Linkup. I like your chore chart. It reminds me so much of what I would do for my kids when they were younger. But I like that you put detailed tasks within each category. I find myself having to “break it down” like that too!